Stephanie and Rush were married Cannery Ballroom in Nashville, Tennessee on a rainy Saturday in September. 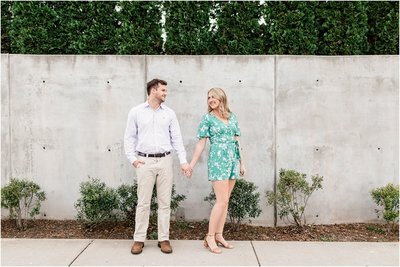 This warehouse setting was a great location for them because most days Cannery Ballroom is a music venue and the couple are both in the music business. The wedding day started at an Air B&B in midtown where Stephanie and her bridesmaids were getting ready. Rush was getting ready at Lowe’s Vanderbilt. We all made our way to Cannery for everyone to put on their suit and dresses. The couple chose to so a first look, so we did that in the bar area. Since it was rainy that day we had to stay inside for all the portraits, but that’s okay because it’s good luck for it to rain on your wedding day. After portraits were finished, guests began to arrive and were given glasses of champagne. The ceremony was lovely as Stephanie and Rush exchanged vows and professed their love. They retired to a private room for a private dinner while their guests enjoyed cocktails and conversation. The staff flipped the aisle to tables for a buffet dinner. Each table was named after a love song, which is again perfect given their professions. After dinner was over, Stephanie and Rush had their first dance, which was so fun. Family and friends danced for hours before sending them off with fireworks. Stephanie and Rush are so great together because they have one of the core foundations of marriage, laughter.